Okay, that may have been a little misleading – I have two quinces. 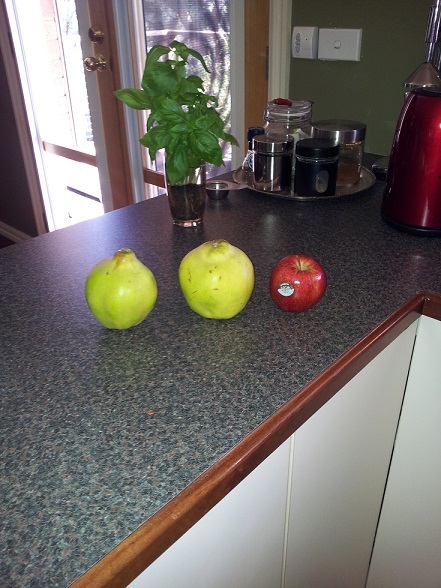 See them there, next to the apple [on the counter I cleaned just for you]? I grew those beauties! And tonight they become quince compote. I’ll be serving them, Hungarian style, as the accompaniment to home made chicken schnitzel. No rice, no pasta, no potatoes – just schnitzel and quinces. The two flavours and textures compliment each other beautifully. 1. First, peel your quince. As you can see, I’m using a fairly heavy duty peeler. That’s because raw quince is as hard to peel as pumpkin. 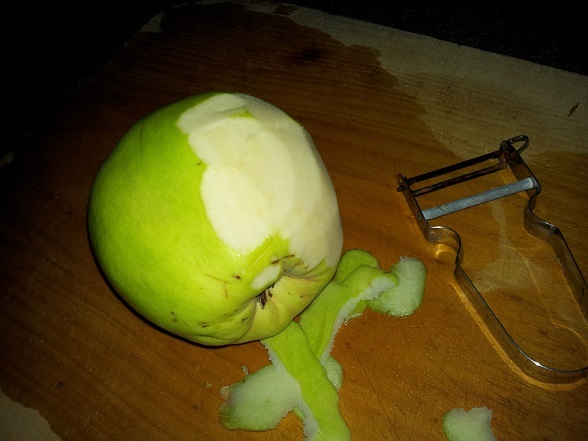 Harder, actually, as you can’t afford to chop away half the fruit with the peel. Do persevere though, and when you’re done, run the fruit under cold water as it browns very quickly once it’s naked. Like a pumpkin, raw quince is very dense, and the core is hard to get out, so this is my way of making life easier on myself. 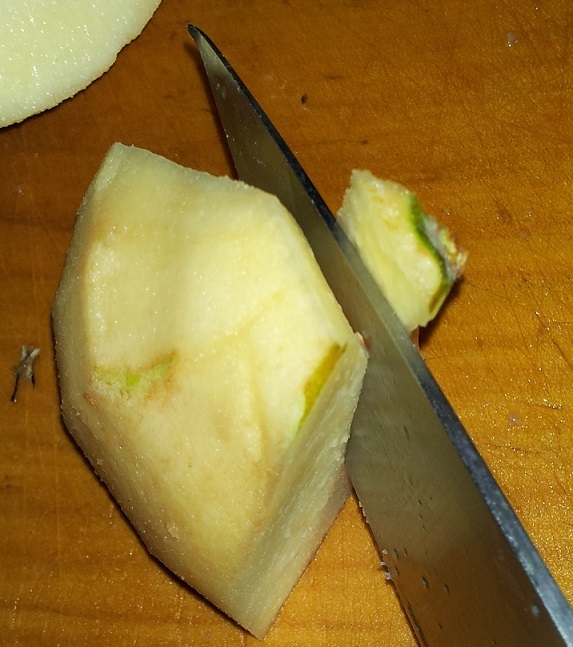 Cut the quince in half as shown in the photo to the left. 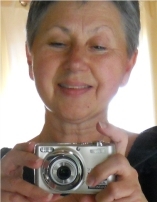 Then cut it into quarters, and finally into eighths. Again, as you cut, dunk the cut pieces into water. This cutting is like origami in reverse, but when you’re down to eighths, you can quite easily cut that section of core out using a sharp knife held at an angle. Once the bits of core are out, you should be able to slice the remaining flesh quite easily. 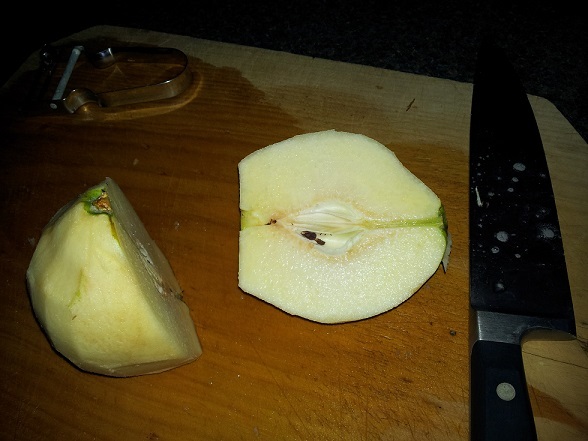 I’m an impatient cook so I tend to slice the quince quite fine as it takes longer to cook than, say, an apple. Most recipes I found online called for insane amounts of sugar – i.e. 1 cup of sugar per 2 cups of liquid. I like to be able to taste the flavour of the quince, and I admit I don’t have a sweet tooth, so my version calls for about 3 cups of water to 1/2 a cup of sugar. Using whichever set of ingredients you prefer, combine the sugar and water in a pot large enough to take the quinces and bring to the boil. Pour the sliced quince into the sugar syrup. Jiggle the pot to get the quince settled into the syrup. Bring the pot to the boil again, and then turn down to the gentlest simmer. Partially cover the pot with a lid – i.e. so the syrup doesn’t evaporate too quickly but steam can escape. 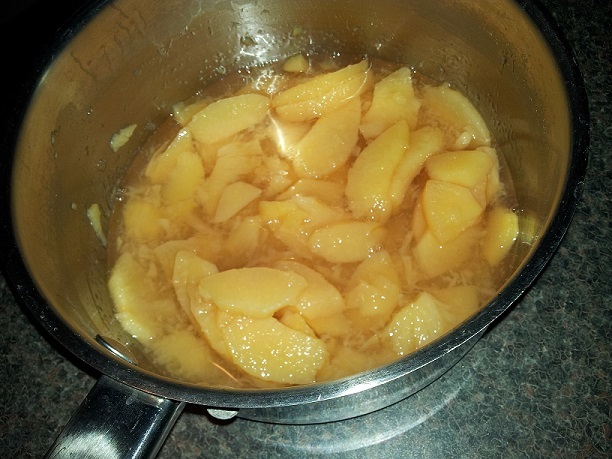 Then simmer gently for about an hour until the quince are tender. Serve hot with a meat [pork is lovely too], or allow to cool and have as a dessert with cream or ice-cream.